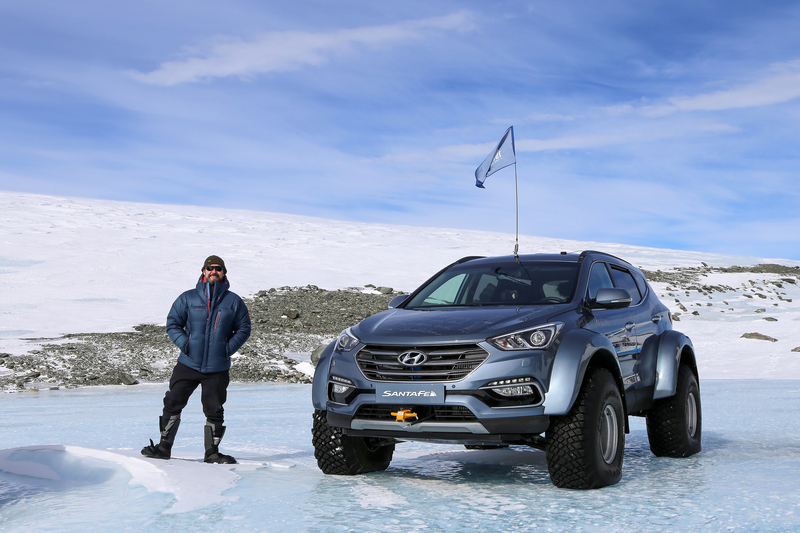 On the 100th anniversary of renowned polar explorer Sir Ernest Shackleton's attempt to cross the Antarctic continent, his great-grandson has completed the trip in a Hyundai family car. Patrick Bergel – who attempted the challenge in December 2016 – drove more than 3,500 miles in a modified Hyundai Santa Fe over some of Antarctica's toughest terrain to commemorate Shackleton's Trans-Antarctic expedition and is the first person to complete the challenge in a car. The 46-year-old entrepreneur from London completed the challenge in 30 days in a Hyundai Sante Fe that had been modified by Arctic Trucks – an Icelandic company that specialises in converting vehicles to cope with extreme conditions. At points the temperature dropped to minus 28 degrees Celsius and the team had to navigate crevasses, snow storms and difficult terrain, as well as suffering from hallucinations. Bergel said: "I'm not a polar explorer; I'm an indoor guy. So it was a big cultural shift – and it was quite something to have been the first to do this. "Getting to the South Pole was a special moment. The fact that this was a place my great grandfather tried to get to more than once and I was there, it felt like a genuine connection. "What we did though was one thousandth as hard as what they did. There's no comparison with the modern equipment and comparative luxury. But it was an amazing journey, and an amazing achievement." Bergel and the expedition crew took the route Shackleton had originally planned to take from Union Glacier to the South Pole, before following the Leverett Glacier and the Trans-Antarctic Mountains – which included passing the continent's active volcano, Mount Erebus – and on towards the Ross Ice Shelf and McMurdo. The team's expedition leader Gisli Jónsson from Arctic Trucks was tasked with modifying the 2.2-litre diesel Santa Fe for the Antarctic, which included fitting suspension to suit the large snow tyres and a larger fuel tank that ran on Jet A-1 fuel, the only fuel used in Antarctica. Otherwise, the Hyundai ran with the standard gearbox, front differential, engine and driveshaft. On completing the mission, Jónsson said: "People who have a lot of experience of Antarctica know what it does to machinery: basically, anything and everything falls apart. Even the big machines crack up and break apart. "This was the first time this full traverse has ever been attempted, let alone doing it there and back. A lot of people thought we would never ever make it and when we returned they couldn't believe we'd actually done it!" Hyundai has made a short film showing Bergel's expedition and the incredibly tough conditions he and the team faced.